I think I've just broken my own record for the longest time between posts! During this time Rosie has been unwell with a chest and ear infection (for over two weeks). It's been a long time since she's been under the weather so she deserved to have a good run at it! I'm pleased to say she's much better now and as a result is moving on leaps and bounds – making up for that time lost nose blowing. I've also been busy preparing and practicing for something I never thought I'd see myself doing in a million years... a public talk to 200 odd people for Mencap which takes place this Friday in Birmingham. I'm so far out of my comfort zone my legs are going to jelly just typing about it! I'll let you know how it goes (if it goes well of course!). For those of you that have ever wondered where Rosie's surname comes from; it's of Swiss origin. I myself am dual national (well treble if you count England and Scotland as two!) and therefore Rosie is one quarter Swiss. The reason I mention this is that I wanted to share a video with you (below) of my Dad and Rosie enjoying a Swiss nursery rhyme together. Rosie seems to be embracing her Swiss roots well as I haven't a clue what they're singing about but she appears to have full understanding of what's going on! What I love about this video is how Grandad just 'gets' Rosie, they always interact so well together regardless of which language they converse in! When she swipes for him (it's affection) near the end he doesn't even flinch. Rosie has an amazing and unique bond with all of her grandparents and we feel very privileged that we have all of their support. It seems a bit silly saying that now – of course they all love Rosie to pieces but I have read a lot of bits and bobs around social media recently that have really made me appreciate just how lucky we are to have such genuine support from our parents. Rosie also had her (now annual) Cardio check up last week which provided myself with a full on work-out trying to restrain her! It really isn't a traumatic experience in terms of pain, its exactly the same as having a scan when pregnant, same procedure, same machines just over the heart area. However Rosie has been through so much in her early days that she tends to get very distressed when any medical professional comes near her. Even a simple visit to the Doctor will end in a minor hysterical meltdown. As soon as the consultant had finished and we sat her upright she smiled and laughed, chatting away to him as if the previous five minutes of seeming torture hadn't even occurred! I'm delighted to say that everything appears in order. After the last scan she appeared to have residual leakage from the valve but even that has cleared up so we came out feeling extremely happy and, as always, eternally grateful to the wonderful medical team that made all this possible. Grandad Future's Rosie from The Future's Rosie on Vimeo. Your blog is always so inspiring! Rosie is delightful. Aunty Ruth shared the Vaseline episode photo with us too. So funny! Hope Birmingham goes well - be like a swan - glide on the surface and paddle furiously underneath. Great blog - as ever Tom. Glad Rosie is well again. Share your pain about the hospital appointments. Daniel used to go for regular blood tests for his thyroid and it took several people, including myself, to hold him while the doctor took some blood. It was very distressing for him and us. But as you say, afterwards he'd be full of smiles for the medical staff as if nothing had happened. We'd be the ones still shaking. We always had to go for a cup of tea to calm down afterwards. Good luck on Friday. Just be yourself Tom. Rosie's story is so great you'll have a captive audience. The video of Rosie and her Grandpa is too precious. Glad you mentioned Rosie's distress with her doctors. It is easy to understand her anxiety given what she has been through and while restraining her may seem to be required for certain procedures it can only serve to add to her, and your, distress. Validating how she feels is key, as is finding the right child friendly physicians and making sure they all know that she finds these events stressful. Other families may have good ideas about ways to make the process easier, like cups of tea afterwards or visits to a favorite place or activity. Sure there are many families of children who have undergone extensive medical procedures and other childhood traumas who can pitch in more. I've stated it a million times and I will again. I believe we are the ones disabled being short that extra chromosome. I believe it is the chromosome for joy. Lovely blog post! The nursery rhyme video is fab! Hope that your talk went well, sure you were brilliant. I agree with sparrow eye above, we do need people with DS to improve our lives. Love the video and good news from the doctor's office. Marcus has had his share of trauma and anxiety at the hands of medicine - and healing for that matter - When he was little we did "play therapy" with the old Fisher Price Doctors Cart. It made a *big* difference in his anxiety levels as we moved on. We accidentally did PTSD therapy for children, consider looking into that. And even recently did some therapy to help him cope with a new treatment. (The body remembers more than you think.) Acknowledging this as PTSD has actually helped him to get worthwhile support and move forward. 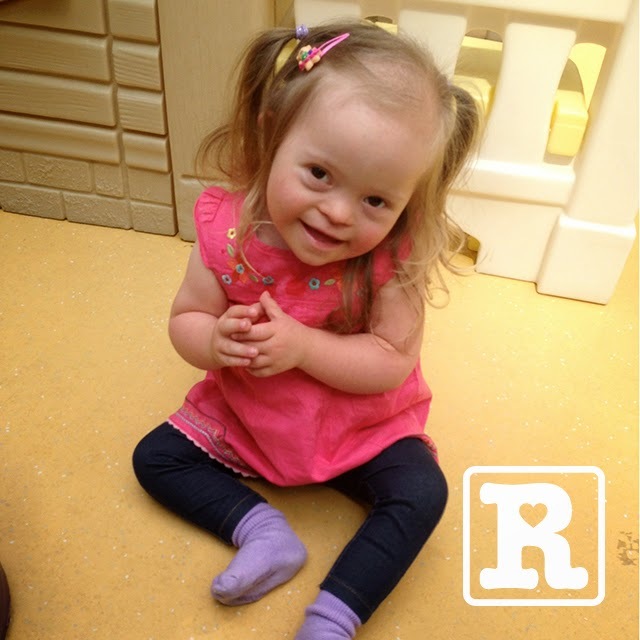 That's my 2 cents for today :) Thanks for sharing Rosie with us, she's a delight! I found your blog through the Telegraph UK website. May I say that amid a world that seems to encourage us to treat others including children as utilities that are either useful or worn out/damaged and thus to be discarded, you and your family epitomise an open and generous alternative that gives heart to those of us who want alternatives to the self-seeking utilitarian philosophies. 'First World, developed societies' have a long way to go in their attitude to children with Down's Syndrome and other conditions that do not represent the image of how a child should be courtesy of certain parts of the mass media, health 'experts', educational 'experts', social commentators, etc who seem to relegate unborn children who will have special needs to the dustbin and over-emphasise the difficulties of raising special needs children. And in fact as the Thai mother of Gammy, the child who was discarded by the Australian couple who could not even ensure he was given some funds to at least make his life easier, has demonstrated, those who live in the 'undeveloped' or 'Third World' can teach our richer societies about richness of attitude and putting that into action. Thank you, Rosie and Family.